The song is often interpreted as a metaphor for the English, Scots-Irish and general British and Irish experience in western early and colonial America, with nods to their earlier experiences on the margins of Ireland, Scotland, and the Borders. The first Chieftains recording of the song, from their earlier album The Long Black Veil and sung by Mark Knopfler, is set in Ireland. A later recording by The Chieftains and Rosanne Cash from The Chieftains' album Further Down the Old Plank Road, ends with the man's being released and traveling across the Atlantic to "ramble through old Ireland/And travel Scotland o'er". Despite leaving America, he finds that he is still in love and mentally fixated on the woman, known in this version as Flora. Joan Baez recorded the song in 1961, including it on her second album; her live concerts have frequently included performances of the song well into the 2010s. Bob Dylan, The Chieftains, Bert Jansch - Live At The 12 Bar, Josh Andrews, The Flash Girls, Caroline Groussain, Sheri Kling, Show of Hands, Peter, Paul and Mary (as "Flora"), Mark Knopfler, Crooked Still, Dirty Linen, Branimir Štulić (in Croatian, titled "Usne Vrele Višnje") and Pat Gubler (PG Six) on the album Slightly Sorry (Amish Records 2010) among others. The "Green Mountain Bluegrass Band" does a version of this song as well. Arizona road band Major Lingo performed a long jam version of the song using an electric slide guitar and slightly different lyrics. “This old ballad has been kept alive over the centuries by both print and oral tradition. Originally an English street ballad (or broadside), the song became particularly popular in the United States by parlor singers and ballad-printers. During the 19th century it was known throughout the country and, in time, became part of the folk heritage. Its popularity was such that in Kansas, local versifiers used the song for a parody:"
Holly Near recorded a parody of the song about the lesbian scene in which the singer, a woman, was obsessed with Lily, the flora of the West. The traditional Irish tune is a variant of that also commonly used for the folk song The Lakes of Pontchartrain and it belongs to the same Irish melody-family as a song variously known as On the Trail of the Buffalo / Buffalo Skinners / The Hills of Mexico / The State of Arkansas / Boggus Creek. 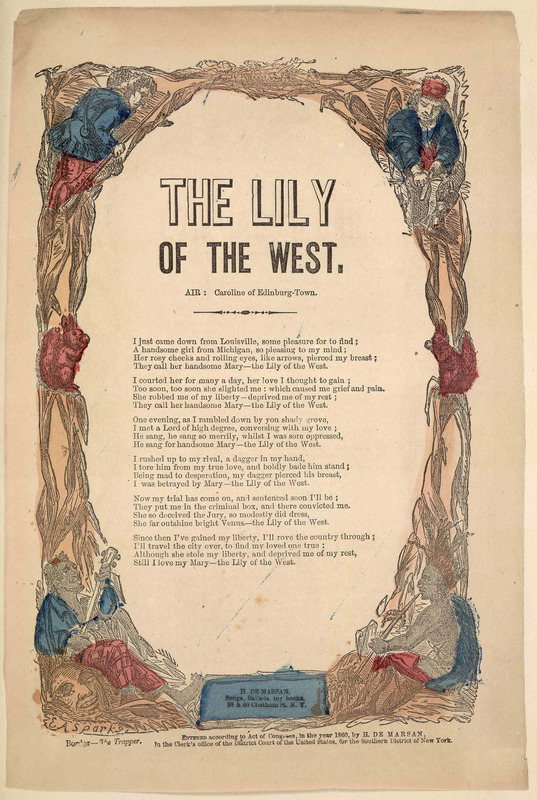 ^ "Broadside ballad entitled 'Flora the Lily of the West'". digital.nls.uk. Retrieved 2018-06-28. ^ "Lily of the West". The Library of Congress. Retrieved 2018-06-28. ^ "Lily of the West - Song Information". Retrieved 2018-06-28. ^ "Wolf Folklore Collection: Lily of the West". web.lyon.edu. Retrieved 2018-06-28. ^ "Lily Of The West | The Official Bob Dylan Site". www.bobdylan.com. Retrieved 2018-06-28. ^ "Usne vrele višnje". Azra. Retrieved 2017-06-04. Cowan, Frank. Southwestern Pennsylvania in Song and Story. Greensburg, Pa.: Privately printed (1878). This page was last edited on 30 June 2018, at 15:18 (UTC).